Saves Your Back Where The Strecher Can't! A corset type lift designed for fallen patients/residents. Finally, paramedics, healthcare workers in hospitals, long term care residences, EMS and firemen have a unique tool toassist the lifting of fallen patients in a dignified manner for the patient, while saving on back injuries. Experience easier and safer patient handling. Minimize patient discomfort & risk of injury. Rapid application even in confined space. Attaches handles to the patient from the bathroom floor all the way to the hospital bed with one simple product. Prevents unsafe improvising by eliminating the need to use bed sheets and transfer tarps for a vertical lift. The Nylon Binder Lift received the JEMS 2013 Hot Product of the Year award and EMS World 2013 Innovation of the Year award. Constructed with Cordura Denier 1000 nylon and polypropylene web strapping for the handles. The removable leg straps are made from BioThane® and are 100% impervious to bodily fluids. This makes decontamination of the leg straps quick and easy. The core of the device is machine washable. Covered by a 2 year full warranty and has an expected use life of 10+ years. The Vinyl Binder Lift received the JEMS 2014 Hot Product of the Year award and is our premier model. Constructed with Bondcote® vinyl coated polyester, and BioThane® for the handles and removable leg straps. Both materials used are 100% impervious to bodily fluid and are chemical resistant. To decontaminate simply wipe down with a sani-wipe or other germicide and place back in the storage bag for next use. Covered by a 2 year full warranty and has an expected use life of 10+ years. The BINDER LIFT™ harness is THE SAFER WAY TO LIFT BECAUSE HUMANS DON'T COME WITH HANDLES! The BINDER LIFT™ was specifically designed for EMS/Firefighter and Caregiving personnel who have been called upon to provide lift assistance to non-trauma patients who have fallen and cannot get up without help. The BINDER LIFT™ was created to quickly and easily attach around the patients torso. It incorporates multiple hand loops (14-18 depending on harness size)to allow from one to six people to safely provide lift assistance. The BINDER LIFT™ will SAVE TIME, SAVE MONEY and SAVE YOUR BACK! 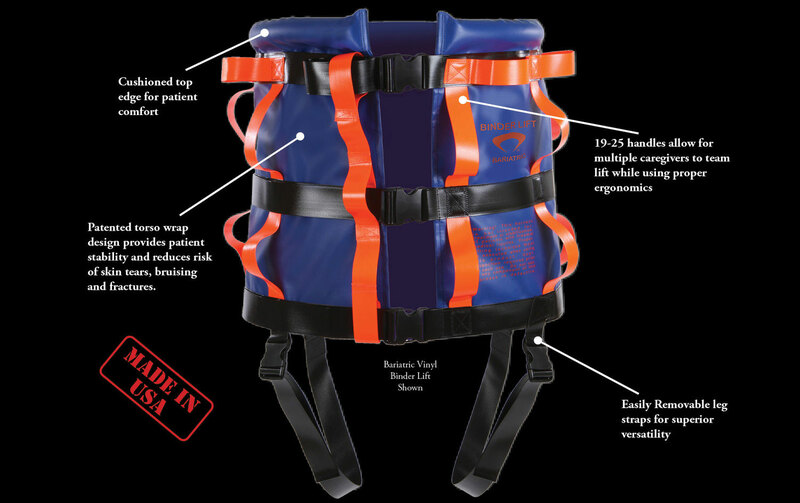 The BINDER LIFT™ harness is entirely made in the U.S.A. It is constructed using a combination of 2” polypropylene web strapping and Cordura Denier 1000 nylon for its base. The web strapping has a minimum breaking strength of 1200 lb while the Cordura has a 500/550 lb warp/weave strength (without the web strap). The Cordura utilizes a special coating to resist fluid absorption and can be easily cleaned using soap and water, sanitary wipes or machine wash on gentle cycle. The BINDER LIFT™ uses heavy duty rated 250 lb quick release buckles for easy attachment/detachment. Used in combination, over 750 lbs of HORIZONTAL PULL would be required before failure was achieved. Because the lifting process requires VERTICAL PULL, these buckles are more than sufficient when properly used. The leg straps are what allow the lower set of lifting handles to be utilized without causing the BINDER LIFT™ to scrunch up the torso as the lifting process is executed. Thus, the 500 lb combined buckle rating on the leg straps has proven to be more than sufficient when used in conjunction with the chest buckles. Also, for added patient comfort, the BINDER LIFT™ incorporates a 1 ½ inch foam cushion along the top edge to prevent skin tearing or gouging of the patients underarms. The BINDER LIFT™ is lightweight (less than 3 lbs) and compactible(fits in a 16”x 12”x 3” storage bag). The BINDER LIFT™ comes in two models, the MX & XLT, which together will accommodate a patient chest size range from 34” – 82”. The MX will adjust from 34”- 63” and the XLT range is from 58” – 82”. The BINDER LIFT™ is unique in that it BENEFITS first and foremost, the EMT/Care Provider (end user) by providing them a way to grasp the patient without compromising good lifting posture/body mechanics. By providing a multitude of lifting handles from which to choose, the end user can share the burden of the lifting weight with other lifting partners. SECONDLY, the BINDER LIFT™ benefits the patient by: securely and safely enveloping them during the lifting procedure, minimizing the risk of injury due to skin tears, bruising or mishandling, as well as reducing patient discomfort and distress. THIRDLY, the BINDER LIFT™ benefits the department or service that utilizes this unique lifting harness by MINIMIZING THE RISK of incurring extensive monetary expenses associated with a lower back injury claim incurred by its employee(s). The BINDER LIFT™ will SAVE your department TIME AND MONEY by providing your employee/volunteer the RIGHT tool for the job. Having the right tool eliminates wasted/excessive time spent on the call. The BINDER LIFT™ reduces the need to call for additional trucks/manpower for the majority of lift-assist calls. When extra manpower is needed, LESS TIME will be spent by eliminating the need to improvise.